Jim (sans toupe) with a young admirer out in New Mexico. 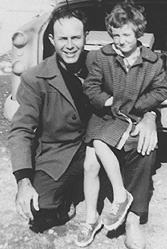 Jim genuinely loved children and desperately wanted to adopt one. But his schedule was such that he and Mary decided it would not be best, at least until he stopped travelling so much and could be home more. In the final months of his life, Jim had told friends he would not be spending so much time on the road. Indeed, he planned to take it easier. The account in last Summer's pseudo-biography of Jim supposedly brushing past young fans is an absurd falsehood, say friends, given how warmly he felt toward them. There are many, many stories of kindnesses Jim showed towards children, which he did privately and with no thought of the publicity value. Photo by Lucky Brazeal Davis and courtesy of Tom Kirby. ©All contents copyright 1999 by Julie Campbell. All worldwide rights reserved. Photos and text may be downloaded from this site for personal use ONLY. All photographs used with exclusive permission of their owners, with signed affadavits on file (at the law offices of Wallentine, O'Toole in Omaha, Nebraska) attesting to this fact. Any re-use of photos/text is strictly prohibited and will constitute violation of copyright, with violators prosecuted to the fullest extent of the law.